A CT Museum Wedding at the Wadsworth Atheneum in Hartford, Connecticut is a very unique wedding experience. This black and white photograph from a CT Museum Wedding shows the fun being had at a wedding reception held at this special location. While the Wadsworth Atheneum Museum of Art is not currently holding wedding events within its decorated walls, it has hosted beautiful celebrations in the past. Couples who have chosen to have their wedding at the Wadsworth end up with photographed memories that are filled with both historic and contemporary art. The setting of an art museum wedding makes for an exceptional experience for all wedding attendees. At this wedding, the bride, groom and their guests celebrated and danced the night away at the Wadsworth Atheneum in the museum's Avery Court event space. The image shows the bride and groom at the heart of a circle of family and friends. This moment, frozen by the flash of the camera, captures the uninhibited fun that the couple have with one another and how much they truly enjoy being together. 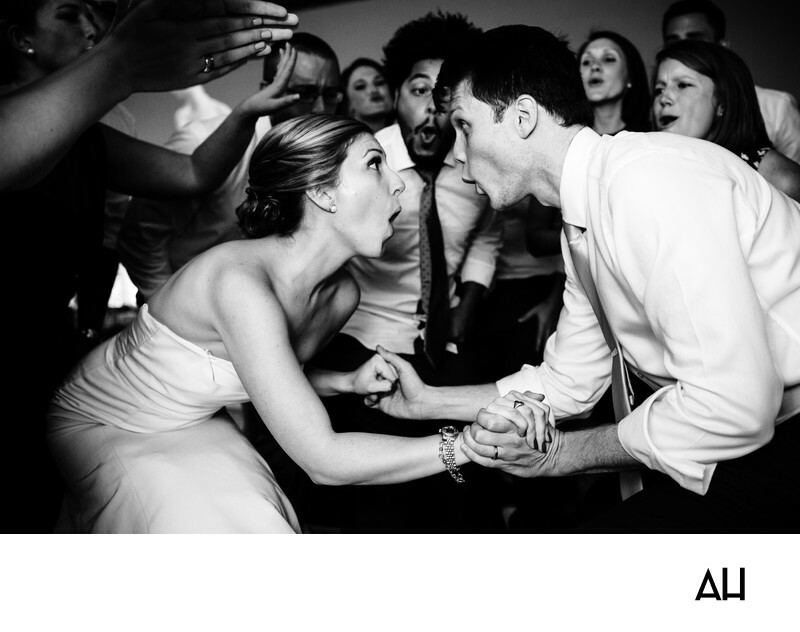 In the picture, the couple hold hands as they sink towards the floor at the center of their dancing guests. The pair sing along with the words of the song that fills up the court, echoing around the works of art that decorate the area. The couple’s guests belt out the words as well, clapping and moving to the beat of the song. The bride and groom don’t seem to notice their friends though in this instant. They are caught up in this moment together, with eyes only for each other.